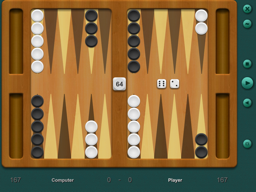 This pro backgammon version is designed for skilled players. It has many playing options, an intuitive and easy to use interface, including a game position editor. 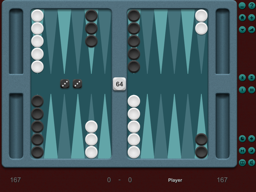 Several 2D and 3D boards, game or match play, statistical information, save/load for games, doubling cube, new checker styles and rating support for twenty users are a few key features. The current version has been optimized for Windows 8 and touch enabled Tablet PCs. Play this game and you can find out your real rating and have a lot of fun! Download now and try it for free! Auto-play, statistics, recommended move, back move, Jacoby and Crawford rules, sound effects, easy mouse based interface, keyboard commands, pure random dice, doubling cube, are just a few of our game improvements. We also added an external dice generator, in order to allow you checking the fairness of our game. This version allows you to record an entire game and watch it later; it also includes an auto-resign feature for computer and auto play forced moves. Do not hesitate to try it, then send us your suggestions by e-mail. It's your favorite backgammon opponent! The shareware version for Windows is available for download. It has a nice board design, with a 2D and 3D viewing option. Graphic improvements, several checker styles, many playing options and more intuitive mouse and keyboard commands are also present in this version. Three different game levels, from beginner to advanced, extend the fun and develop your playing skills. 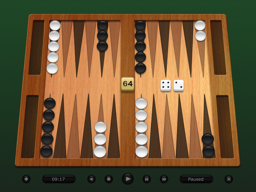 Registered users can send their ratings by e-mail to our backgammon top with only a mouse click. Download, install and try it for free! 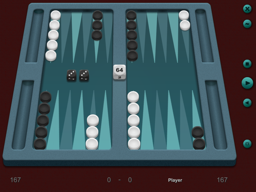 Now you can play on the new designed 3D game boards, with eight checker types, having different shapes and colors. Help pages, statistics, recommended move, back move, Jacoby and Crawford rules, sound effects, easy mouse based interface, keyboard commands, pure random dice, doubling cube, are just a few of our game improvements. This version allows you to record an entire game and watch it later. 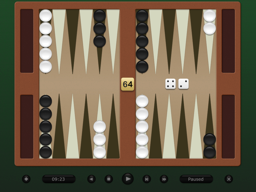 Download and test it for free (all options are enabled), then send us your suggestions and thoughts in order to improve the backgammon game. 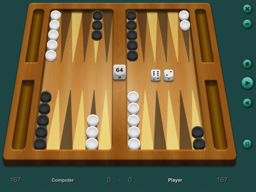 This application allows you to play backgammon online with your friends from all over the world. You have the possibility to simply and directly play for fun with any opponent, using his IP address or the messenger ID. It has a nice 2D an 3D graphics, several checker models to choose from, doubling cube, flipping sides, stereo sounds FX and voices. You can invite your opponents to play rated or unrated games, having the doubling rules enabled or not, and the match length is up to 64 points. Users of a local network or the ones directly connected to the Internet, may prefer an IP connection; in other cases, a Yahoo Messenger (older versions) communication can be used.